Tune a DataStax Enterprise cluster by following recommendations from the OpsCenter Performance Service. View, troubleshoot, and trace slow queries. View slow queries along with alerts and recommendations for improving query performance. The Backup Service provides automatic scheduled backup, manual backup, and manual restore of DSE cluster data. The Repair Service performs repairs across a DataStax Enterprise cluster with minimal impact to cluster performance. The Best Practice service allows scheduling pre-defined best practice rules that check various properties of clusters and environments, reporting which active rules pass or fail a configured scan. The OpsCenter Performance Service provides visual monitoring of diagnostics collected through the DSE Performance Service, displays alerts, and provides recommendations for optimizing cluster performance. Why use the OpsCenter Performance Service? The OpsCenter Performance Service expedites investigating and troubleshooting performance issues with your clusters. Enable the OpsCenter Performance Service. Enabling each performance object also enables its default configuration. Disable the OpsCenter Performance during peak production time. Set OpsCenter Performance Service permissions for each user role and cluster. 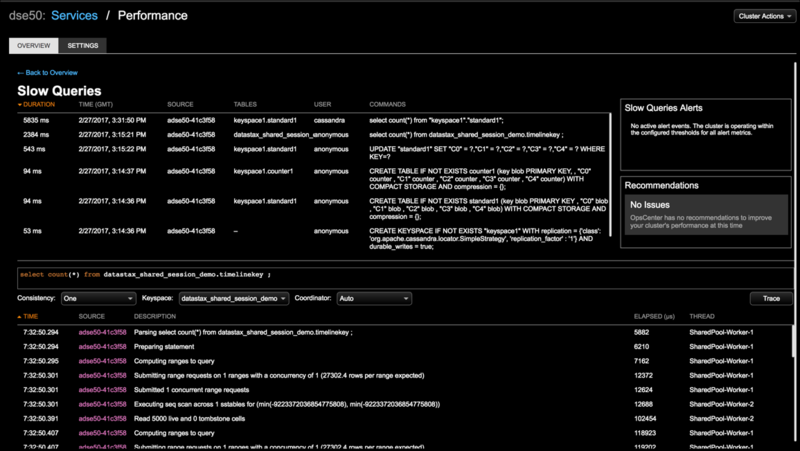 Configure the slow query log in the OpsCenter Performance Service. OpsCenter records any queries that take longer than the configured threshold. Trace identified slow queries to view the stages in a query and determine where performance bottlenecks occur. Trace ad hoc CQL queries. Guidelines for configuring suggested latency alerts for tracking slow queries. Any alerts triggered for read and write latencies appear in the Slow Queries Alerts panel within the Slow Queries performance page. Configure rules for the Performance Service - Slow Queries Advisor in the Best Practice Service. Reference of recommendations that appear for assistance with resolving slow queries. View table performance and potential issues at a glance. View data for thread pool statistics at a high or detailed level. View any slow queries along with alerts and recommendations for improving query performance. Any CQL tables with queries that take longer than the configured threshold appear in the Slow Queries list. System and OpsCenter keyspaces are excluded from the Slow Queries list. Note: The ability to trace queries requires permission granted in your user role. The User column displays the users who are running slow queries for OpsCenter versions 6.0.9 and later. When viewing slow queries for DSE versions 5.1 and later, slow queries are only shown for data since the last time the agent was restarted. For versions of DSE earlier than 5.1, all historical slow query data is available for slow queries. For more information, see the known issue and referenced KB article. Click cluster name > Services. Click the Configure link for the Performance Service. The Overview tab displays the performance panels. Click the title bar of the Slow Queries panel. The Slow Queries performance details page appears. Sort the slow queries by any column header.